The Town of Firestone received a Water Efficiency Grant from the Colorado Water Conservation Board (CWCB) in the fall of 2016. As part of the grant there is a pilot program to retrofit 50 qualifying residential homes with a smart irrigation controller. Beginning Jan, 1, 2017, residents are encouraged to apply to be 1 of 50 residents to receive the smart irrigation controller for free. Applicant must be Town of Firestone water utilities customer. Program is not available for new construction. Only single-family residential properties can apply. Only one application can be submitted per property. At least one year of prior water usage at the property is required to qualify. Prior year’s total water consumption must be 175,000 gallon or more to qualify for this program. Applicant must have and maintain Wi-Fi service at the property at all times. The smart irrigation controller must be continuously connected to Wi-Fi to operate the evapotranspiration weather information connection. This network connection will need to be established during installation. 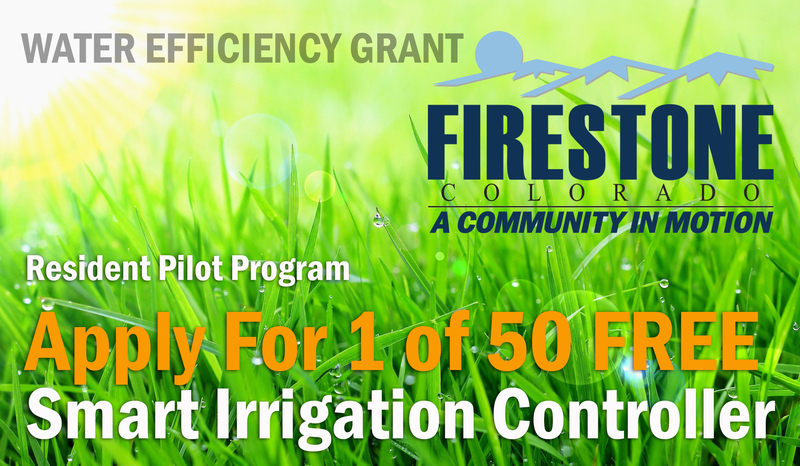 Smart irrigation controller retrofit must be installed and applicant must schedule an onsite inspection of controller retrofit with the Town of Firestone within 30 days of receipt. Other requirements maybe required. Please see official application for a complete list. Wireless rain and freeze sensor is included. Station run times can range between 1 minute and 6 hours. Watering day schedules can be custom days of the week - odd or even calendar days - and cyclic (such as every two days, or every three days, etc.). Controller may be set to 12-hour AM/PM and/or 24-hour mode. Controller has 365-day calendar back up against power interruptions. Controller can be remotely accessed via Mobile App using an Apple iOS or Android compatible mobile device with internet access. Controller view shall display an image of the controller with name, station or zone list and local weather report. Expanded view shall allow remote programming of irrigation schedules including a manual watering feature. Calendar view shall show a graphical representation of the selected controller irrigation schedule. Remote control view shall provide instant access to manual operation for each station or zone. Controller settings view shall provide configuration and editing of controller information, network settings and notification preferences. Please visit Town Hall for a complete list of controller and mobile app features.